Technology-based entrepreneurship education is very suitable to be developed in higher education. The entrepreneurship education model is currently not producing many scholars who want to start their life after graduating from college with entrepreneurship. The purpose of this study is determining the factors that influence the intention of entrepreneurship of motorcycle workshops for students. This research method is a causal survey. The sample in this research is 242 students and taken by proportional random sampling. Data analysis techniques include descriptive statistical analysis, inferential statistics for linearity test, regression significance and for multivariate statistics using path analysis. After knowing the factors that can affect the intention of entrepreneurship, it is developed through research model of learning development, to plan entrepreneur model of technology-based motorcycle workshop. 1. Self-reliance has positive direct effect on motorcycle knowledge. 2. Self-reliance has a direct positive effect on the courage to take risks. 3. Motorcycle knowledge has a direct positive effect on the courage to take risks. 4. Self-reliance directly positive to entrepreneurship intention of a motorcycle workshop. 5. Motorcycle knowledge has a direct positive effect on entrepreneurship intention of a motorcycle workshop. 6. The courage to take risks has a direct positive effect on entrepreneurship intention of a motorcycle workshop. It can be concluded that autonomy has a direct positive effect on motorcycle knowledge, autonomy and knowledge of motorcycles have a direct positive effect on the courage to take risks, and self-reliance, knowledge of motorcycles, and the courage to take risks positively affect the intention of entrepreneurship workshop motorcycle. Self-Reliance, Entrepreneurship Intention, Motorcycle Workshop. The development of the Indonesian economy is currently heavily influenced by the growing of small and medium enterprises which continue to grow. Statistics show there are 54.5 million micro businesses and 56 thousand small businesses in Indonesia (Umar et al., 2018). They are able to create the largest employment opportunities for the Indonesian nation reaching 104.6 million people. Small businesses are scattered in various corners to housing built in garages as well as in kitchens and seen on the side of the road like culinary business, grocery store, car workshop, motorcycle workshop, welding workshop, and so on. Entrepreneurs in small business are required to be able to innovate business in order to increase buyer interest and competitiveness because consumers basically want something new in the marketed products (Nurgraha & Mulyadi, 2018). This condition is an illustration that these small and medium enterprises are the backbone of Indonesia's growing economy. The existence of micro business is recognized and appreciated by many parties (government, private, and society) and able to move the state economy (Johannesson, 2017). Entrepreneurship is someone who has an ability in terms of creating business activities and the ability to create it requires the existence of creativity and continuous innovation to find something different from the existing before, where creativity and innovation are ultimately able to contribute to society a lot (Fellnhofer, 2017). Thus, to keep economic growth a strong economy, especially in developing countries, entrepreneurship should be cultivated. Economic problems are a complex issue, not only with respect to decent work and livelihoods but also on job availability, employment status, education, wage rates, competence, work attitudes, relatively low productivity, and other employment issues. The increasing unemployment condition annually becomes a fundamental issue for governments, businesses, and communities (Misini & Badivuku-Pantina, 2017). Expansion of employment opportunities in the business world is expected to open employment opportunities in the formal business sector, informally, to work independently as an entrepreneur (ILO, 2002). On the other hand the development of the population has consequences for mobility and its supporters, such as the increasing number of motorcycle vehicles every year which is always increasing (Soehodho, 2007). The number of motorcycles continues to increase every year, as people tend to choose motorcycles as a means of transportation every day for the office, school, college, or market, rather than public transport. This condition is an opportunity to open a workshop care and repair is very wide open, both in terms of business and job opportunities for middle-level skilled workers as technicians in motorcycle repair shops. This opportunity can actually be utilized by the young to become entrepreneurs in the field of motorcycle workshop (Wandani et al., 2016). Self-reliance is defined as a mental attitude or state of a person who can determine yourself and can be expressed in the mind or action or behavior of someone who has the ability to think and solve problems and do not want to depend on others, responsible, freedom of attitude, and stand-alone. These characteristics of self-reliance began to increase in adolescence and can be assessed (Walz et al., 2016). Thus the self-reliance intended in this study implies: a situation in which a person who has the desire to compete to advance for his own good, able to take decisions and initiatives to overcome problems encountered, have confidence in doing his duties, and be responsible for what he does. The self-reliance of a person is very decisive behavior after the adult child to be able to account for his work and believe in his own ability, not dependent on others. Knowledge is something that is present and manifested in one's soul and mind because of the reaction, contact, and relationship with the environment and the natural surroundings. This knowledge includes emotions, traditions, skills, information, creeds, and thoughts. Know is the lowest level of knowledge, including remembering return (recall) against and the specific, and all material the learned or stimulus that has been received (Brod et al., 2013). Meanwhile, based on the difference in the way of work used to obtain it and account for its truth, knowledge is divided into three, namely: scientific knowledge, moral knowledge, and religious knowledge (Ani, 2016). Motorcycle knowledge is scientific knowledge because it is a knowledge that has a justification base, is systematic, and is inter subjective. Motorcycle knowledge in this study is a material in the learning process that learn about motorcycle, the working principle of motor 4 steps and 2 steps, the components on motor torak fuel, completeness of motor engine fuel, electricity, and chasis of the vehicle (Abdo, 2013). With the provision of skills and knowledge possessed, one will try according to the skill or ability. The future is owned by risk takers and not security seekers, as the more entrepreneurs seek security, the less security they have and the more they pursue opportunities, the more security that will be achieved. For an entrepreneur, failure is not a disaster, merely indicating that more effort is needed (Hoy, 2014). While the success of a business is not only measured from the mastery of management, business type, marketing, or business basics, but influenced by good mental attitude such as dreaming, willing to work hard and disciplined, observant to see the market, keep the spirit in business, never give up, endless innovation, and dare to take risks . A business that excessively protects against risks will not benefit the business owner, but is too neither risk-taking nor does it guarantee a business will earn high profits (Claessens & Kodres, 2014). Therefore, it is needed risk management that can make choices when faced with different risks. The courage to take the business risks referred to in this study is the confidence that someone does in acting or trying to open a motorcycle maintenance and repair shop with the courage to bear all the consequences of uncertainty that will occur and is characterized by the ability to take risks and anticipatory capabilities with a bold indicator doing business, dare to compete, courageous decision-making, risk-minimizing ability, and readiness to challenge. Intention is the motive to be reached as a force that can enhance the expression and all aspects of a person's life that are geared towards achieving goals (Syam et al., 2018). The intention in a person shows the motivation that influences the action; the stronger the intention is likely to be implemented. Individuals have stronger intentions to act when action is felt feasible and enjoyable (Gagné & Deci, 2005). In The Entrepreneurial Event Theory, assumed that someone has a direction to go that is influenced by important factors who are around them, such as: family, work, social status, funding ability, cultural values, education, etc. the will bring it on an behavior. Intentions are characterized by perceived desirability, perceived feasibility, and propensity to act (Wibowo et al., 2018). Thus, the intention of entrepreneurship of a motorcycle repair shop is a strong intention towards personal commitment to undertake entrepreneurial activities in the form of a motorcycle workshop characterized by perceived desirability, perceived feasibility, and propensity to act. Strong intention toward personal commitment can be: belief in his ability, firmness, and influence of the surrounding environment, networking ability, ability in seeking capital, knowledge owned, self-confidence, and determination owned. The problems that arise above will affect the economic development in Indonesia so it needs to be found solutions, whether the factors of self-reliance, knowledge of motorcycles, the courage to take risks are the elements that can affect one's intention to open a service shop work (maintenance and repair) motorcycles, so that the economic stretching in Indonesia can be improved from various small and medium enterprises, especially in the field of repair and maintenance workshop of motorcycle. The purpose of this study is to determine the influence of self-reliance, knowledge of motorcycles, and the courage to take risks to the students’ intention of entrepreneurship workshop motorcycle. This research uses causal survey method with path analysis approach (Wibowo et al., 2018). 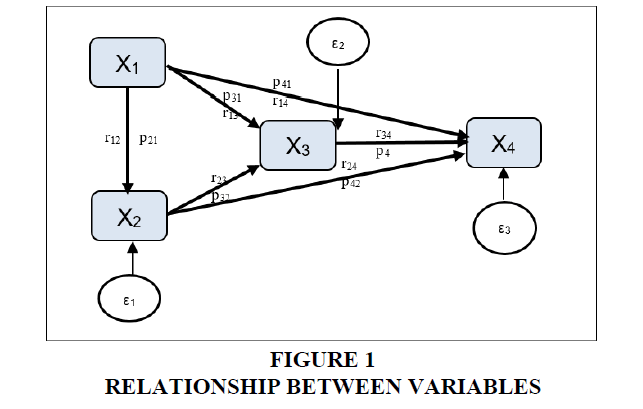 Path analysis is a technique to analyze the causal relationship that occurs in multiple regression if the independent variable affects the dependent variable not only directly, but also indirectly (Baidi & Suyatno, 2018) (Figure 1). Based on the description, the exogenous variable is self-reliance (X1), motorcycle knowledge (X2), risk taking (X3), while the endogenous variable is the intention of motorcycle workshop entrepreneurship (X4). Although in the data processing stage, each variable can be either an independent variable or a dependent variable. The target population is all students of Engineering Department of Engineering Faculty of Universitas Negeri Jakarta as many as 1076 people, while the affordable population is a student of class 613 people. The sample is taken by proportional random sampling. The sample size is 242 students, referring to Slovin formula. Types of instruments in this study are typical performance variables, such as: self-reliance (X1), risk-taking courage (X3) and motorcycle workshop entrepreneurship intentions (X4). Characteristics of measurement of the typical performance are the performance that becomes a typical character and tends to be raised consciously in the form of response to certain situations that are facing (Schmader et al., 2008). The instrument was developed for data collection using a Likert scale. Points in scale are statements with five answer choices, namely: Strongly Agree (SA), Agree (A), Neutral (N), Disagree (DA), and Strongly Disagree (SDA). The scale is presented in a favorable and unfavorable statement. For supporting statements, assessment weights are: (SA)=5, (A)=4, (N)=3, (DA)=2, and (SDA)=1. On the contrary for statements that do not support, the weight of the assessment is: (SA)=1, (A)=2, (N)=3, (DA)=4, and (SDA)=5. Self-reliance is one's attitude in self-management, which is influenced by aspects of emotional, social, and intellectual expressed in actions and behavior. This indicator is measured by: firmness in action, satisfaction with one's own efforts, not dependent on others, adjustment, ability to analyze, perseverance and tenacity, and responsibility. The results of the assessment are in the form of scores obtained through 37 independent instruments. Risk-taking courage is an attitude of confidence that a person acts in or tries to open a motorcycle workshop with his courage to bear all the consequences of uncertainty that will occur and is characterized by the ability to take risks and anticipatory abilities. Indicators are measured by: dare to run a business, dare to compete, dare to make decisions, the ability to minimize risks, and preparedness to face challenges. The results of the assessment are in the form of scores obtained through instruments of 37 items. Motorcycle workshop entrepreneurship intentions is a strong intention towards personal commitment to conduct entrepreneurial activities in the form of a motorcycle workshop marked by perceived desirability, perceived feasibility, and propensity to act. These variable indicators are: confidence in his ability, determination, and influence of the surrounding environment, ability to build networks, ability to find capital, knowledge, confidence, and determination. To get the results of the assessment of the entrepreneurship intention of a motorcycle workshop, through the respondent in the form of a score. The score was obtained through an instrument measuring the entrepreneurial intentions of a motorcycle workshop as many as 50 items. The motorcycle knowledge variable (X2) using the type of instrument got maximum performance. Types of maximal performing tests are identical to the cognitive abilities capable of being shown by individuals in response to the items in a test. Basic knowledge of the motorcycle is the ability of person in the form of cognitive knowledge, comprehension, application, analysis, synthesis, and evaluation of a motorcycle to learn about: motorcycles, the working principle of motor fuel, components of motor fuel, fuel system, electrical system, cooling system, lubrication system, braking system, suspension system, and chassis. The basic motorcycle knowledge instrument is a multiple choice objective test with five alternative answers, namely a, b, c, d, e which refers to the cognitive aspects of knowledge (C1), understanding (C2), application (C3), analysis (C4), synthesis (C5), and evaluation (C6) are classified into high-level cognitive abilities. The answer score is given by means of the correct answer given a score of one and the wrong answer given a score of zero. The number of items for this instrument is 42 items. The results of filling in the instrument are then carried out by the requirements of the analysis test (Winarno & Wijijayanti, 2018), such as: normality test, linearity test and significance test. Testing is done with the SPSS program. 1. Normality test, to find out whether the selected sample comes from a normal or abnormal distribution population. In this study the estimated normality error test used is the Lilliefors test (Razali, & Wah, 2001). 2. Linearity and significance test, to determine whether two variables have a linear or not significant relationship. After all the above test requirements have been met, the next step is testing the path analysis. Path coefficient calculation is done through Structural Equation Modeling (SEM) LISREL 8.72 Full Version program. Normality test results show normal. The results can be seen in Table 1. The test results show a linear and significant relationship. The results can be seen in Table 2. The results of SEM calculations obtained path coefficients p21=0.304, p31=0.326, p32=0.287, p41=0.173, p42=0.133, and p43=0.563. These values are not less than 0.05. A summary of the path coefficient calculation, tcount, and t-value is presented in Table 3. 1. tcount=4.94>ttable (0.05; 2.42)=0.96 then H0 is rejected so the path coefficient p21 is significant. This fact means that self-reliance has a direct positive effect on motorcycle knowledge. 2. tcount=5.52>ttable (0.05; 2.42)=1.96 then H0 is rejected so the p31 path coefficient is significant. This fact means that self-reliance has a direct positive effect on the courage to take risks. 3. tcount=4.87>ttable (0.05; 2.42)=1.96 then H0 is rejected so the path coefficient of p32 is significant. This fact implies that motorcycle knowledge has a direct positive effect on the courage to take risks. 4. tcount=3.45>ttable(0.05; 2.42) then H0 is rejected so the path coefficient p41 is significant. This fact means that self-reliance has a direct positive effect on entrepreneurship intention of a motorcycle workshop. 5. tcount=2.68>ttable(0.05; 2.42)=1.96 then H0 is rejected so the path coefficient p42 is significant. This fact gives the meaning that the knowledge of motorcycles has a direct positive effect on entrepreneurship intention of a motorcycle workshop. 6. tcount=10.86>ttable(0.05; 2.42)=1.96 then H0 is rejected so the p43 path coefficient is significant. This fact gives the meaning that the courage to take a positive direct positive impact on entrepreneurship intention of a motorcycle workshop. 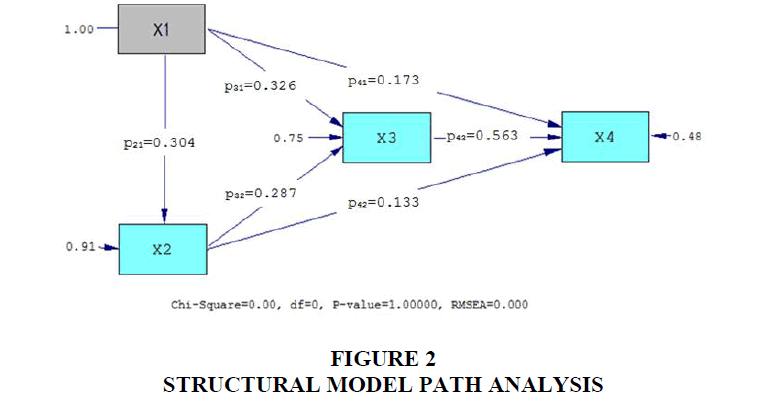 The structural model of path analysis results is shown in Figure 2. These findings prove that the self-reliance of students will give effect to the ability of understanding in learning the knowledge of motorcycles. For that, it is necessary to establish self-reliance through lecture duties that can cultivate confidence in himself with real issues in the automotive field, such as observation to automotive workshops. Understanding cognitive knowledge is learning (Brod et al., 2013) about automotive, especially motorcycles, and becomes easier to learn by students who can manage themselves when viewed from the emotional, social, and intellectual aspects. The ability to manage oneself can be seen from the firmness of acting, the satisfaction of the business itself, not dependent on others, able to adjust, able to analyze, diligent and tenacious, and responsible. Therefore, to provide the students with a strong self-reliance needs to be pursued by the concept of learning both in the classroom and in the laboratory and academic atmosphere of the campus that can form the nature does not depend on other people or friends. The result of this research indicates that stubbornness have a direct influence on the courage to take risks. Thus the high level of courage to take risks can be explained by self-reliance. The amount of direct autonomy contribution to risk-taking is 10.63%. Contribution of 10.63% to risk-taking courage, indicating that the characteristics of self-reliance possessed by students will be able to provide strength and courage to face challenges those are at risk. Therefore, to increase the courage to take risks for students need to be built by providing guidance and build the character of students to have more self-reliance. The dominant factors affecting the success of entrepreneurship are vision and mission, self-confidence, optimism, creative and innovative, ambitious and passionate, originality, future-oriented, task-oriented and resultant, have the soul of the leader, dare to take risks, honest, sociable and communicate, clever take advantage of opportunities (Sulistyadi et al., 2014). It can be done to support the creation of a strong and independent student soul and have the courage to develop and excel in face the dynamics of life. The results showed that motorcycle knowledge had a direct effect on the courage to make decisions. While the contribution given by the courage to take the risk of basic knowledge of 8.24%. Thus the high degree of risk taking courage can be explained by automotive literacy. The courage to take the risks that students have arises or develops in accordance with their own personal development based on experience and the environment. Therefore, it is necessary to increase the courage to take student risks through the concept of motorcycle knowledge learning which is integrated with the learning of troubleshooting through automotive practice. 1. Soul development, planting and implementation of entrepreneurship education and follow-up entrepreneurship education for alumni. 2. To educate and equip students with knowledge, skills and entrepreneurial spirit, self-reliance alumni and increase revenue sources. Based on the findings, study shows that self-reliance directly affects the intention of entrepreneurship workshop motorcycle. Contribution of 2.99% indicates that self-reliance affects the intention of entrepreneurship workshop motorcycle. Thus the high intension of the entrepreneurship of a motorcycle workshop can be explained by self-reliance. This contribution indicates that the student is still unsure about performing activities related to oneself and dependence on others (Baidi & Suyatno, 2018). This condition causes the desire or the tendency to entrepreneurship is also lacking. For that need to be given motivation and learning that entrepreneurship is a pretty prestigious business and able to make every student's desires for the success of his career. The results showed that the knowledge of motorcycles directly affect the intention of entrepreneurship workshop motorcycle. The contribution of 1.77% provides an explanation that the knowledge of motorcycles gives low impact to the intention of entrepreneurship workshop motorcycle. The contribution of motorcycle knowledge variable to the entrepreneurship intention of motorcycle workshop is the lowest among other variable relations. This indicates that the intention of entrepreneurship of motorcycle repair shop is not too influenced by one's ability to knowledge of motorcycle. The lack of integration of the provision of basic automated knowledge lecture materials with the concept of independent learning and problem solving likely influences their low to entrepreneurship of motorcycle repair shops. Students are only able to understand in the realm of cognitive, but lack the ability to develop skills in the field of automotive to serve as the basic capital to establish a business workshop motorcycle. And with the ability possessed in the automotive field, will provide ease in managing the workshop. Ability to understand automotive material including the skill in doing maintenance the automotive engine, will have an impact on his expectations for the entrepreneurship in the automotive field. If you look at the development of motorcycle, especially motorcycles, then the opportunities that can be caught are businesses that can provide services or market spare part open wide. This condition should be in demand by the students who have knowledge about the automotive, because it already knows the ins and outs of automotive. Therefore, efforts should be made to develop the concept of learning motorcycle knowledge with models of entrepreneurship development automotive workshop. The findings of this study provide a fairly good contribution, especially when compared with other variables. Contribution of 34.34% this proves that the high intention of entrepreneurship workshop motorcycle can be explained by the courage to take risks. This proves that students, who have the risk of taking risk, will have a strong intention in entrepreneurship workshop motorcycle (Wibowo et al., 2018). Courage to take risks here is an effort that students do in acting in opening a business with the courage to bear all the consequences of the uncertainty that will occur (Sulistyadi et al., 2014). The courage to take risks is a condition whereby a person will fight for his or her will and determination to keep trying to achieve his goals and desires, in particular build and start the activities of entrepreneurship workshop motorcycle. In the case of the tendency to entrepreneurship workshop motorcycle, the persistence and determination will make him more daring to start the business with various considerations and calculation of risks to be faced. Therefore, the need to be pursued in the learning process fosters the spirit and strong motivation so that students have the courage in the challenges including the activities that contain risks. 1. Self-reliance has a direct positive effect on motorcycle knowledge; this fact explains that students who have high self-reliance, then the student will be able to understand the material knowledge of motorcycle well. 2. Self-reliance has a direct positive effect on the courage to take risks, this fact explains that students who have high self-reliance, then the student is likely to act with his confidence to dare to face the challenges and risks it faces. 3. Motorcycle knowledge has a direct positive effect on the courage to take risks; this fact explains that students who have a high understanding of motorcycle knowledge, then with the attitude of confidence, courage, ability to take risks, and anticipative ability possessed will be able to deal with all the consequences of the uncertainty that will occur. 5. Knowledge of motorcycles have a direct positive effect on entrepreneurship intention of a motorcycle workshop, this fact explains that the higher level of understanding of motorcycle knowledge material, then the student will have a tendency to act for entrepreneurship workshop motorcycle. 6. The courage to take the risk of direct positive effect on entrepreneurship intention of a motorcycle workshop, this fact explains that the attitude of confidence, courage, ability to take risks, and anticipative ability possessed will be able to encourage his determination to entrepreneurship workshop motorcycle. Abdo, E. (2013). Modern motorcycle technology. Australia; Andover: Delmar; Cengage Learning. Ani, N.C. (2016). Does scientism undermine other forms of knowledge? Verbum et Ecclesia, 37(1), 1-9. Baidi., & Suyatno. (2018). Effect of entrepreneurship education, self efficacy and need for achievement toward student's entrepreneurship intention? : Case study in FEBI, IAIN Surakarta, Indonesia. Journal of Entrepreneurship Education, 21(2), 1-16. Brod, G., Werkle-Bergner, M., & Shing, Y.L. (2013). The Influence of prior knowledge on memory: A developmental cognitive neuroscience perspective. Frontiers in Behavioral Neuroscience, 7, 1-13. Claessens, S., & Kodres, L. (2014). The regulatory responses to the global financial crisis: Some uncomfortable questions. IMF Working Papers, 14(46), 1. Fellnhofer, K. (2017). The power of passion in entrepreneurship education: Entrepreneurial role models encourage passion? Journal of Entrepreneurship Education, 20(1), 58-87. Gagn?, M., & Deci, E.L. (2005). Self-determination theory and work motivation. Journal of Organizational Behavior, 26, 331-362. Hoy, A.W. (2014). Educational psychology active learning edition. Boston; Columbus; Indianapolis: Pearson. ILO. (2002). International labour conference, 90th Session. Decent Work and the Informal Economy. Report of the Director-General, Report VI. Johannesson, J. (2017). The moderating effect of employee education and professional skills on the relationship between entrepreneurial, Journal of Entrepreneurship Education, 20(2), 1-18. Misini, S., & Badivuku-Pantina, M. (2017). The effect of economic growth in relation to unemployment. Journal of Economics and Economic Education Research, 18(1), 1533-3604. Nurgraha, M.J., & Mulyadi, H. (2018). Creating product innovation in micro creative industry in Indonesia. Journal of Entrepreneurship Education, 21(2), 1-11. Razali, N.M., & Wah, Y.B. (2001). Power comparisons of Shapiro-Wilk, Kolmogorov-Smirnov, Lilliefors and Anderson-Darling tests. Journal of Statistical Modelling and Analysis, 2(1), 21-23. Schmader, T., Johns, M., & Forbes, C. (2008). An integrated process model of stereotype threat effects on performance. Psychological Review, 115(2), 336-356. Soehodho, S. (2007). Motorization in Indonesia and its impact to traffic accidents. IATSS Research, 31(2), 27-33. Sulistyadi, K., Sukamdani, N.B., Pengajar, S., & Sahid, U. (2014). Analysis of dominnt factors that different to entrepreneurial successin graduate university of Sahid Surakarta. Journal of Bussiness and Entrepreneurship Economy, 3(1), 6-21. Syam, A., Hasbiah, S., Yunus, M., & Akib, H. (2018). Determinants of entrepreneurship motivation for students at educational institution & education personel in Indonesia. Journal of Entrepreneurship Education, 21(2), 1-12. Umar, A., Sasongko, A.H., & Aguzman, G. (2018). Business model canvas as a solution for competing strategy of small business in Indonesia. International Journal of Entrepreneurship, 22(1), 1-9. Walz, A., Lindsay, N., Soni, S., & Libraries, V.T. (2016). Entrepreneurship: Starting a Business. Pamplin College of Business and Virginia Tech Libraries, 32. Wandani, F.P., Siti, M., Yamamoto, M., & Yoshida, Y. (2016). Spatial econometric analysis of automobile and motorcycle traffic on Indonesian national roads and its socio-economic determinants: Is it local or beyond city boundaries?. IATSS Research. Wibowo, A., Jakarta, U.N., & Jakarta, U.N. (2018). Does teachers? creativity impact on vocational students? entrepreneurial intention? Journal of Entrepreneurship Education, 21(3), 1-12. Winarno, A., & Wijijayanti, T. (2018). Does entrepreneurial literacy correlate to the small-medium enterprises performance in Batu East Java? Academy of Entrepreneurship Journal, 24(1), 1-13.